Carlotta is organizing quickly with much improved banding this morning. Because of this we are estimating top sustained winds a little higher than NHC. 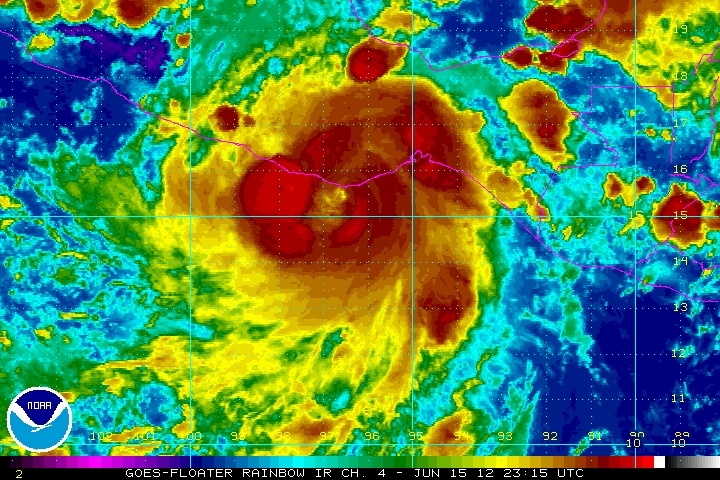 Carlotta is expected to strengthen to a hurricane by the time it is near the southern coast of Mexico by late tomorrow. Preparations for Carlotta should be completed by the end of the day today. As of this morning, some heavy squalls are already just south of the Gulf of Tehuantepec and boaters are urged caution. Heavy rain will pick up on the coast by this evening and winds will pick up steadily during the day Friday. 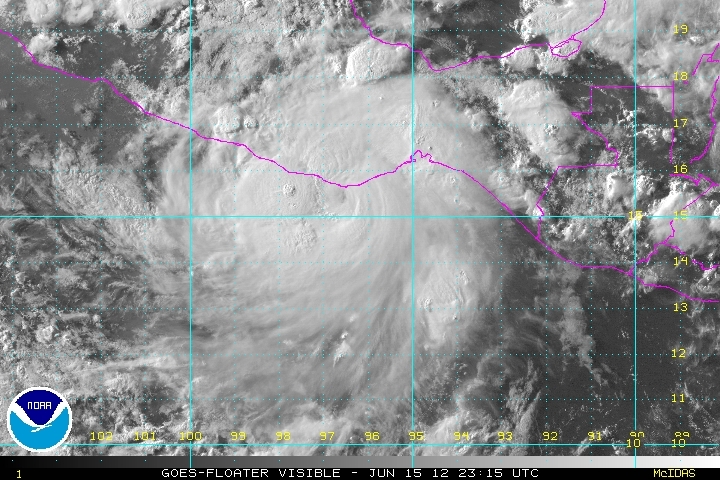 As of 8 am edt / 5 am pdt Carlotta was centered near 10.6 N / 93.4 W or about 600 miles se of Acapulco, Mexico. Movement is nw at about 10 mph. Top sustained winds are estimated at 50 mph (NHC 45 mph). Pressure is estimated at 1001 mb. Carlotta is predicted to move toward the coast of southern Mexico by Friday night and stall near the coast. It should weaken at that point as it interacts with land. Carlotta nearly has an eye indicating that it is getting very close to hurricane strength. Heavy squalls are near the coast of the western side of the Bay of Campeche. Look for wind and rain to pick up today on the South coast of Mexico. The largest impacts from Carlotta will be south of Acapulco to Puerto Angel. Rainfall amounts of 10" will cause flash flooding. Storm surge will impact the coast near and east of where the eye makes landfall. 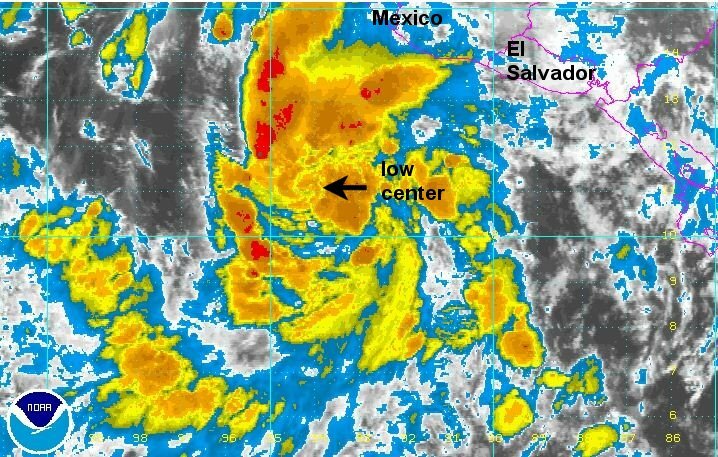 As of 8 am edt / 5 am pdt Carlotta was centered near 13.5 N / 95.6 W or about 160 sse of Puerto angel, Mexico / 355 miles se of Acapulco, Mexico. Movement is nw at about 10 mph. Top sustained winds are estimated at 70 mph (NHC 70 mph). Pressure is estimated at 991 mb. Carlotta is predicted to move toward the coast of southern Mexico by late tonight / early Saturday and stall near the coast. It should weaken at that point as it interacts with land. Carlotta made landfall Friday evening several hours earlier than predicted. It is now winding down on the coast. The following pictures are from landfall yesterday a little west of Puerto Angel. 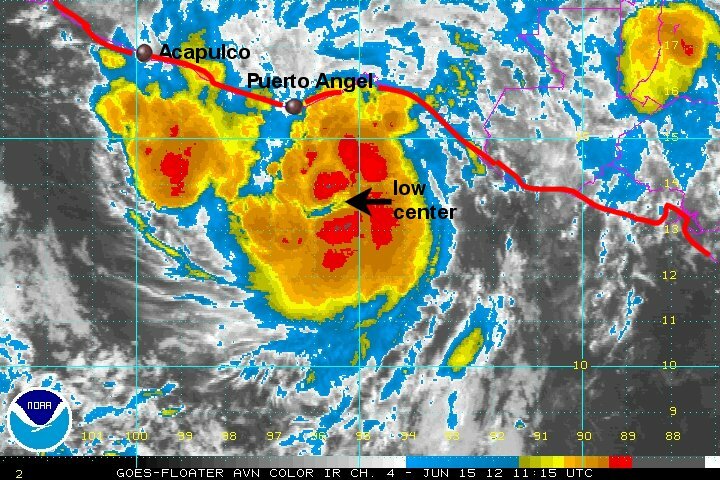 As of 11 am edt / 8 am pdt Carlotta was centered near 17.5 N / 99.5 W or about 50 miles nne of Acapulco, Mexico. Movement is wnw at about 12 mph. Top sustained winds are estimated at 35 mph (NHC 35 mph). Pressure is estimated at 1000 mb. Carlotta will continue to weaken on the coast near Acapulco.